The Blacker-Wood Library at McGill University holds a Cumberland MS not noted in the Cumberland Bibliography by G. E. Bentley, Jr., and it seems worth describing this briefly to keep the record up-to-date, in line with Bentley’s own addition in Blake 42, the format of which I have followed. Part C. Manuscripts which have been traced. Studies from Nature. 1846 (date of completion). Binding: Half leather over boards. Paper: Heavy, no visible water-marks. Numbering and Contents: There are 151 unnumbered leaves to which are attached the drawings, numbered up to 310; those numbered from 293 to 310 are in a folder pasted into the back of the volume. History: Unknown. The volume was presented to the Blacker-Wood Library in 1925. It is listed in: An Introduction to the Literature of Vertebrate Zoology, based chiefly on the Titles in the Blacker Library of Zoology, compiled by Casey A. Wood, McGill University Publications, Series XI (Zoology), No. 24, Oxford U. P., 1931. Date: Some of the drawings are dated, though many are not. The date 1846 on the title-page would appear to be later than any of the contents, some of which go back to the 1780s. 1 Datura Arboria. [e] Blacker-Wood Library, McGill University. 2 Diagram of a Mexican sun altar. Blacker-Wood Library, McGill University. seems more intent on learning and applying the classification schemes of such men as Linnaeus and Cuvier than on developing his own, but the depth of interest shown in such areas as animal vision (drawings 110-23) and the “Parts of Generation of the Garden Snail” (drawing 14) is impressive. A few drawings give us glimpses of Cumberland’s reading, and of his other interests. 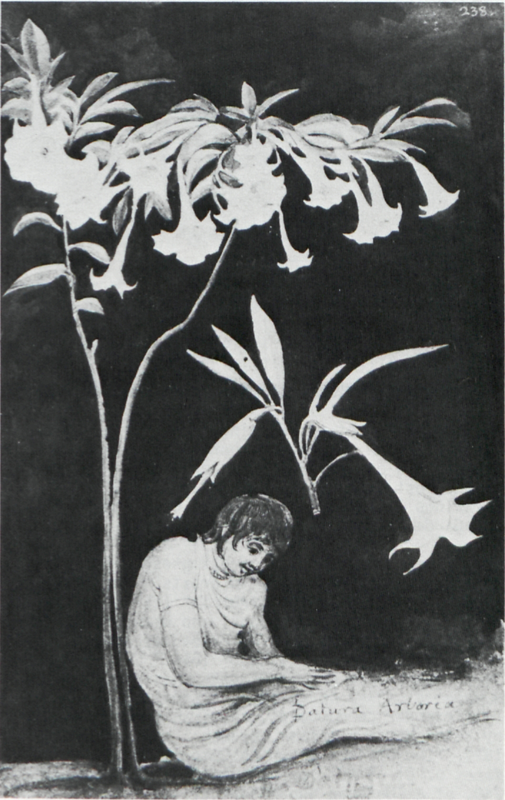 The drawing of a boy labeled “Datura arboria” (illus. 1) is clearly taken from some book, and drawing 250, titled “Pyramid of Cholula,” is described as from “Humbolt’s [sic] Researches Vol. 1. pubd 1814.” The reference is to Researches Concerning the Institutions and Monuments of the Ancient Inhabitants of America—by Alexander de Humboldt, and Translated into English by Helen Maria Williams, London: Longman et al, 1814. The plate from which Cumberland has sketched faces p. 81 of Vol. I. 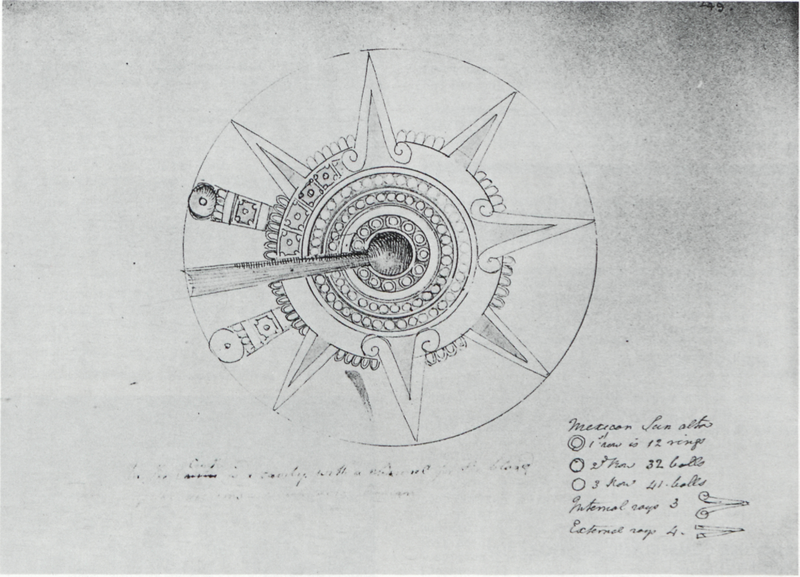 Unexpectedly, his drawing 249, of a “Mexican Sun altar” (illus. 2) with a “channel for the blood of the victims—which were human,” is not taken from these volumes, and I have not traced its source. There is also a note on the verso of 83, a drawing of a grey mullet, that “Irvine had of these 21 Duplicates 19 of Julio Bonasoni,” followed by a list of titles. The Irvine referred to is presumably the James Irvine to whom Cumberland dedicated A Poem on the Landscapes of Great-Britain (A Bibliography of George Cumberland, p. 7). Cumberland of course had a fine collection of Bonasoni’s engravings, wrote a monograph about him, and is assumed to have had a hand in pushing the later Blake towards the linear style of engraving that appears most conspicuously in the illustrations to Dante’s Inferno. Cumberland, like Erasmus Darwin, had more than a touch of the Renaissance universal man about him, and the juxtaposition on the same piece of paper of a drawing of a grey mullet and a list of Bonasoni engravings suggests something of the range of the man’s interests.